As the Times-Picayune noted, it is unclear when Lusher’s faculty held the organizing vote or how the votes split. Ironically, it also means that two of the three New Orleans schools organized by AFT are selective-admissions charters under the Orleans Parish School Board. Lusher and Ben Franklin High School, whose teachers formed a AFT-affiliated union in March 2015, have long been two of the highest performing schools in the city, thanks to their ability to screen students. Those policies also help explain why both charters serve a disproportionate number of white, affluent families. Much of the shock over Monday’s announcement stems from the fact that Lusher is currently in the midst of a nasty legal battle over a proposed change in the way public schools are funded in the city. The plan would allocate funds based on a weighted formula that more accurately reflects the added costs of serving English Language Learners, and at-risk and overage students, and children with special needs. It’s unclear what role, if any, the funding fight played in the decision by Lusher staff to unionize, but what is certain is that the American Federation of Teachers has been waging a long-running campaign to discredit the substantial academic gains made by the city’s public schools in the union’s absence. It’s also become apparent that AFT and its state and local affiliates have been quietly lurking on the sidelines looking for opportunities to organize the city’s charter schools, presumably in an effort to eat away at the reforms from the inside out. Over the past year and a half, AFT has been hiring organizers to target charters in the Crescent City and they’ve been popping up in the most unexpected places. A few weeks ago, for example, UTNO organizers hijacked the end of a performance at ARISE Academy put on by Dancing Grounds, a local non-profit that partners with schools to provide dance instruction to students, to tell its audience of teachers and parents about the benefits of UTNO membership. Screenshot of a job posting on Craigslist from July 2014. 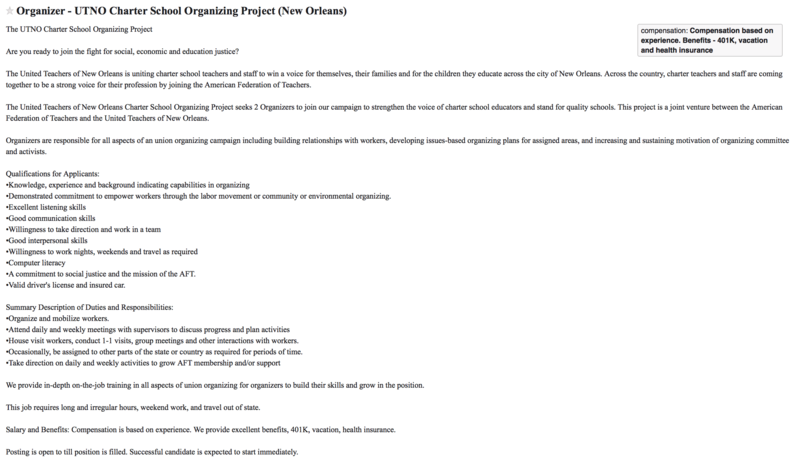 When taken together, AFT allocated nearly a half a million dollars for organizing efforts in New Orleans in the past year – a surprisingly large amount for a school district in a right-to-work state where the teachers union has been pretty much dead since 2005. It should serve as a warning that AFT still poses a threat to reform efforts in this city. The substantial progress we’ve seen in our public schools in New Orleans over the past decade directly contradicts the teachers unions’ pessimistic message that poverty trumps all. That’s why the unions fight so hard to malign the transformation of our public education system and that’s why we shouldn’t fool ourselves into thinking that they wouldn’t tear it all down if we gave them the opportunity to do so. * Full disclosure: I was a member of the United Teachers of New Orleans prior to Hurricane Katrina. ** This is in spite of the fact that Lusher had budget surpluses in excess of $1.4 million in both 2014 and 2015. This post was originally published on PE+CO on April 12, 2016.